This week, Craig opens the first hiking weekend of 2018 with a trek west of Plains that is accessible year-round. Directions: From Plains, travel west on Hwy 200. Three-quarters of a mile past mile post 63, turn right into the marked Munson Creek trailhead parking area. At the trailhead, there’s an immediate fork: Right up an abandoned logging road, or left down the trail. Take the left fork, following the blue plastic diamond trail markers. A short ways down the trail, cross the stream on a log footbridge, then begin the gradual but steady ascent. For the entire six miles to the lookout, the climb is never steep and it never lets up. 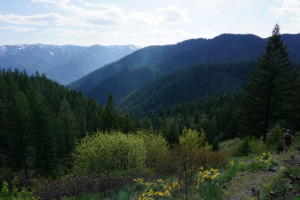 For the first three miles, the trail passes through alternate stands of Douglas fir and ponderosa, cedar, and larch, with some birch mixed in. There’s a small campsite in the third cedar grove, just past the third crossing of Munson Creek, about 3 miles in. Just beyond this, the trail continues ascending to the first big open views of the Cherry Creek Roadless Area. From the top of the Lookout (where there’s an old outhouse), there are expansive views to the Missions, Reservation Divide, Cherry Creek Roadless Area, and the Cabinet Mountains. Note: This is a continuation of the Munson Creek Trail, listed separately.